In 1958, 3M turned restaurant kitchen cleaning upside-down with the world's first scouring hand pad for pots and pans. Now, in 2017, we're making history again with the first in a new generation of hand pads that will change the way you clean pots and pans forever. 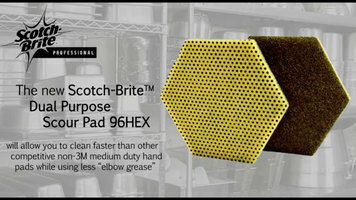 Introducing Scotch-Brite Dual Purpose Scour Pad 96Hex, featuring innovative new "power dot" technology in a unique new hexagon shape that scours faster and leaves a bright shine. Designed especially for demanding commercial kitchen use, it's like having two scouring pads in one. The yellow side features raised "power dots" that cut 5x faster through stubborn, baked-on food, retaining their scouring power longer. The smooth grey side removes fine food particles and grease, leaving a clean, polished surface behind. The Scotch-Brite Dual Purpose Scour Pad 96Hex is easy to rinse off and helps keep your pots and pans looking bright and new. Plus, the unique hexagonal shape makes it easy to grip and to scrub out those hard-to-reach areas. Now imagine what you can do with all the time you'll save when your kitchen clean-up is powered by Scotch-Brite Dual Purpose Scour Pad 96Hex. Request your free sample today! 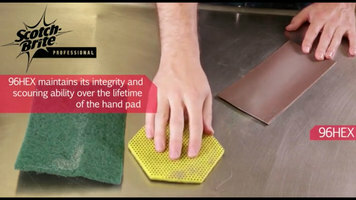 Scour pads are designed to help clean, but they're not always easy to clean themselves. They can trap in food particles, harboring germs and creating a wet, soggy mess. For a pad that's quick and easy to clean, try the Scotch Brite™ Dual Purpose Scour Pad 96HEX. Not only does it rinse clean in seconds, but it prevents food particles from being trapped in the first place! In busy, demanding commercial kitchen environments, scouring pads are tasked with a tough job. With the Scotch Brite™ Dual Purpose Scour Pad 96HEX, you get a superior product that's guaranteed to last longer and service more cookware than the traditional scouring pad. 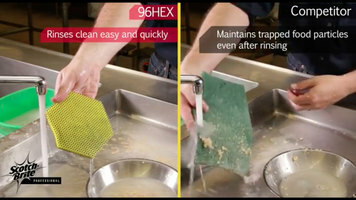 To see the pad in action, check out this short video, and consider how your kitchen could benefit from the new, innovative technology used to design the 96HEX!